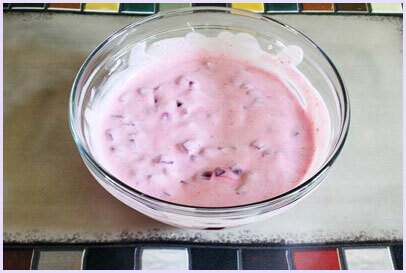 Beetroot Raita recipe – boiled, diced beetroots mixed in chilled yogurt with very few spices. Best side dish for spicy biryani or rice. It is very bright colored, beautiful looking raita. It can be a gorgeous center piece for the dinner table and your guests will be very impressed by looking at and of course by tasting it. It tastes best when it served chilled. Remember as it sits in the fridge, it gets darker and darker in the color. The taste of this raita is mild sweet. So I recommend serving as a side dish with spicy pulao or biryani. Or even you can serve it as an accompaniment to your meal, make sure your meal has spicy curry so raita will balance out the flavors will sooth your palate. 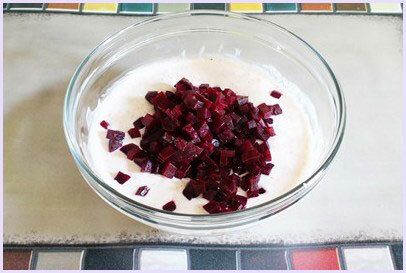 — Pressure cooking: take washed beetroot in the pressure cooker along with 1 cup of water. And cook on medium heat for 10 minutes. Let the pressure go down by itself then open the pressure cooker lid. — Stove top boiling: place whole beetroot in a pan and add water to it. Make sure that water is enough; beets should be immersed in water. And let it simmer for 40 minutes. For smaller beet, it might take 20-30 minutes. — Steaming on stove top: place whole beets in the steamer, steam it on medium heat for about 1 hour. Add enough water as we are steaming it for long time. If water evaporates, then add more hot water to the steamer. — Steaming in microwave: place whole beet in microwave steamer, and microwave it for 7-8 minutes. Do not have microwave steamer, do this. Take some water in a bowl, place a plate on top with beet, and microwave it for 7-8 minutes. Please careful while lifting the plate after cooking, as steam will come out from the water bowl. Check the beetroot by inserting a small knife, if it goes in easily then it’s cooked. Do not cook too much that it becomes mushy. After cooking the beetroot, peel it and chop it. Keep it aside. 2) Take yogurt in a bowl. Add roasted cumin powder, red chili powder and salt. 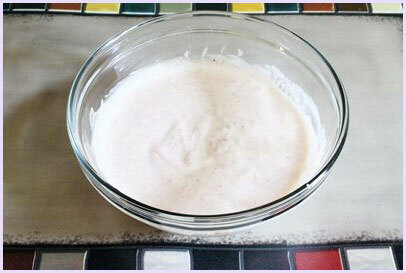 3) Mix well till yogurt is smooth and masala is mixed well. 4) Now add cooked, chopped beetroot. 5) Mix well. 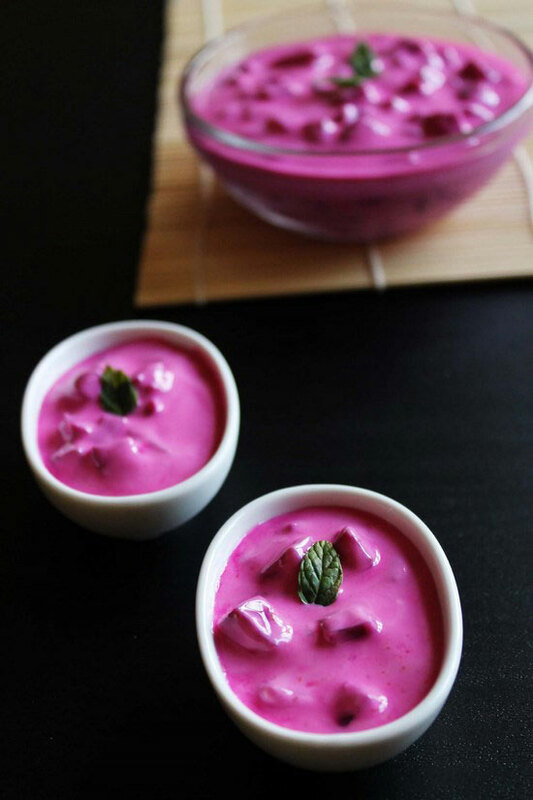 The color of the yogurt will get pink because of the juice from beetroot. Chill the raita in the fridge. Once chilled, remove it to a serving bowl. Garnish with mint leaf and serve. NOTE: As it chills in fridge, the pink color will get darker and darker. Serving suggestion: Serve as a side with your meal. Or serve with any rice dish or pulao like methi rice, spicy veg pulao, tawa pulao. First remove the leaves and stems of the beetroot. Then scrub very well and wash it to remove any dirt. Then cook the beetroot till it is soft. You can steam it or pressure cook it or boil it. Check the beetroot by inserting a small knife, if it goes in easily then it's cooked. After cooking the beetroot, peel it and chop it. Keep it aside. Add roasted cumin powder, red chili powder and salt. 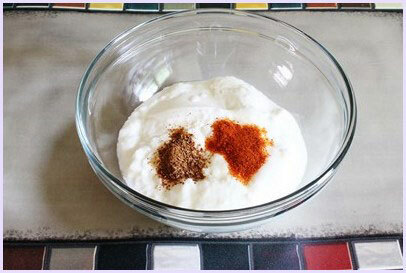 Mix well till yogurt is smooth and masala is mixed well. Now add cooked, chopped beetroot. Mix well. 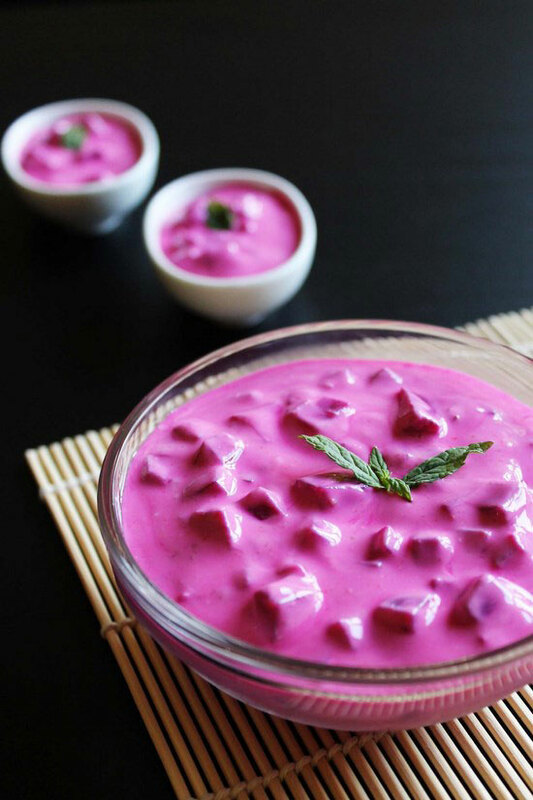 The color of the yogurt will get pink because of the juice from beetroot. Chill the raita in the fridge.